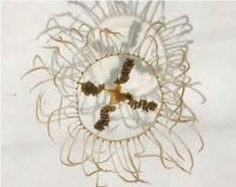 (18/P050) TRENTON – The Department of Environmental Protection is advising recreational users of Ocean County’s Metedeconk River to exercise caution following confirmation of the presence of clinging jellyfish, a non-native species with a powerful sting, in this coastal waterway. In addition to the Metedeconk River, the DEP reminds recreational users of the Shrewsbury and Manasquan rivers – Monmouth County waterways where the clinging jellyfish had been confirmed in recent years – to be alert to its possible presence. The clinging jellyfish, a native to the Pacific Ocean, is small and very difficult to spot in the water. A sting can produce severe pain and other localized symptoms and, in some cases, can result in hospitalization. The DEP encourages the public to use common sense and caution during recreation in areas where the jellyfish are suspected. Anyone wading through these areas, especially near aquatic vegetation, should take precautions, such as wearing boots or waders to protect themselves. Swimming near lifeguarded beaches is always encouraged. The clinging jellyfish was first confirmed in New Jersey in 2016 in the Manasquan River at the Point Pleasant Canal. The DEP has been working with Montclair University in studying the possible distribution of clinging jellyfish in New Jersey. Previous surveys in 2016 and 2017 found a single clinging jellyfish from the Manasquan River and did not detect the jellyfish outside isolated populations in the Shrewsbury River. Montclair researchers this week confirmed the presence of about 15 clinging jellyfish of varying sizes off a private dock in the Metedeconk. Genetic testing is being conducted for final verification. The Metedeconk River flows into the northern Barnegat Bay. The DEP is conducting additional surveys of this area and the river. 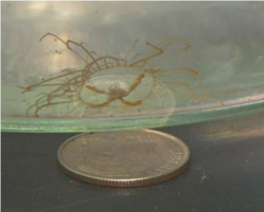 Sea nettles, another type of jellyfish with a less powerful sting, are common in Barnegat Bay but are much larger. The clinging jellyfish ranges from the size of a dime to about the size of a quarter. It has a distinctive red, orange or violet cross across its middle.